« What’s In a (Middle) Name? The great thing about the Internet is that whenever you search for something and can’t find it, you’re likely to run across something else that’s nearly as good. I check on eBay from time to time, looking for items having to do with Lovewell, Kansas, hoping to see picture postcards, or even better, booklets of photographs of the village in its prime. One of my prized possessions is just such a booklet for Formoso, Kansas, which shows a number of houses and businesses as they appeared in 1909. Designed as a marketing tool to promote the young town, which had been platted only about twenty years earlier, the photographic tour of its assets may have had some minor but temporary impact, since that year saw Formoso swell to its all-time zenith with a population of some 400 residents, about the same size as Lovewell. While doing a search several months back, I did find a postcard, unfortunately not the kind with a picture on the back, but something that told a rich story nonetheless. 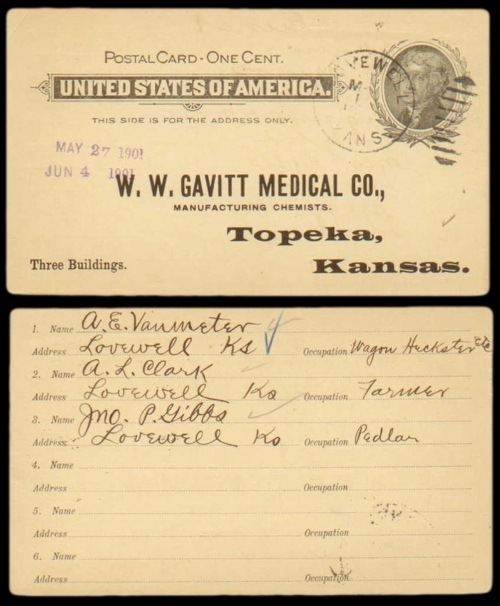 The 1901 postcard was addressed to the W.W. Gavitt Medical Company of Topeka, manufacturers of herbal remedies, whose sales were conducted strictly door-to-door. The purpose of the card was to establish a sales team in the Lovewell area, and three men had signed up: A. E. Vanmeter, A. L. Clark, and John P. Gibbs. The postcard and what I learned about the W. W. Gavitt company of “Manufacturing Chemists” dovetails nicely with several of my recent postings. "A. E. Vanmeter," or Adam Van Meter (The surname formerly appeared as two words, which seem to have become firmly conjoined in recent years) was the father of Villa Viola Van Meter, who married Thomas Lovewell’s son Stephen, and Lulu Mae Van Meter, who married Stephen’s brother William Frank. A. L. Cark gave his occupation as farmer on the postcard to the Gavitt Company, Gibbs was already a bona fide peddler, and at first glance it seems that Adam Van Meter called himself a “wagon hackster, etc.” Never having heard of such a thing, I looked it up and discovered that “hackster” is synonymous with “ruffian” or “assassin.” Searching for the term “wagon hackster” only led me back to the original postcard listing on eBay. Taking a close look at the writing on the back of the card, I realized that the “a” is not quite closed, and thus not an “a” at all. It’s a “u.” The term Adam Van Meter actually used was “wagon huckster,” in other words, a peddler who drove a huckster wagon, which is sometimes described as "a variety store on wheels." One of the items Adam Van Meter would now peddle from his wagon, after signing on as an agent for the Gavitt Company, was Gavitt’s System Regulator, “Composed Entirely of ‘Native’ Herbs, Roots and Barks,” guaranteed to cure “ALL Blood, Stomach, Kidney and Liver Troubles.” Among the twenty-one ingredients in this compound were sassafras, liverwort, balmony, magnolia, rhubarb, prickly ash, poplar, spearmint, elecampane, sarsaparilla, mandrake, juniper, burdock, Canada balsam, boneset, wormwood, and yellow dock. This pharmacological bonanza promised to ease an even longer list of chronic diseases and bothersome conditions. Many of the ingredients in Gavitt’s System Regulator are still sold in health food stores, where their curative powers continue to be touted. With warnings about harmful drug interactions still many decades distant, Gavitt’s factory crammed a bounty of nature’s miracles into a single tablet that solved every conceivable ill all at once, and sold 100 tablets, which the company estimated to be about a year’s worth of cures, for a dollar. As I mentioned, the story touches on a number of topics I’ve written on lately. For instance, W. W. Gavitt solicited testimonials from celebrities who were willing to sing the praises of his pills. One of those who signed on was middleweight champ Bob Fitzsimmons, the man who lost a bout with “Sailor” Tom Sharkey in 1896, thanks to a controversial foul called by referee Wyatt Earp, a fight I wrote a few words about on February 5th. Two weeks ago I posted about double-cousins, the children produced by siblings who marry siblings, such as the sons of Thomas Lovewell and the daughters of Adam Van Meter. Finally, we get to the Civil War, the subject of even more-recent postings. Much of the information I found about W. W. Gavitt, “Topeka’s Medicine Man," is from a fascinating website devoted to Civil War era medicine. Gavitt arrived in Topeka shortly after the Civil War, to start a firm that dealt in real estate and coal. He began manufacturing his own line of patent medicines after first selling “Our Native Herbs” for the Dr. Perkins Medical Company of Washington, D.C. The Gavitt family's pill business lasted almost a century, until the founder’s youngest son sold it in 1967, just as America’s health food craze was getting underway, and a firm that would change its name to GNC began expanding from its home base in Pittsburgh. The past, as you may have heard, is never dead. It’s still around. It just costs more now than it used to.